You can earn 17 Bread Bucks on this product! If you’ve ever made jam or jelly at home, you know most recipes require more sugar than fruit—oftentimes 4 to 7 cups!—causing many people to look for other ways to preserve more naturally and with less sugar. Pomona’s Pectin is the answer to this canning conundrum. 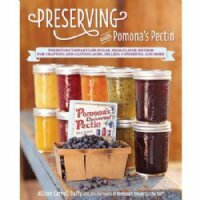 Unlike other popular pectins, which are activated by sugar, Pomona’s is a sugar- and preservative-free citrus pectin that does not require sugar to jell. As a result, jams and jellies can be made with less, little, or no sugar at all and also require much less cooking time than traditional recipes, allowing you to create jams that are not only healthier and quicker to make, but filled with more fresh flavor! If you haven’t tried Pomona’s already (prepare to be smitten! ), click here to order! Allison Carroll Duffy is a Master Food Preserver, trained through the University of Maine Cooperative Extension. She holds a Master’s degree in Gastronomy from Boston University and teaches canning and preserving classes and workshops. She has written about food for various publications including the Boston Globe and Backpacker magazine. Allison runs the Canning Craft blog (http://www.canningcraft.com) and lives in Portland, ME with her husband and two young sons.